"Montmartre" is a name that's often abused or misused. We've limited our hotel suggestions to the core of "Village Montmartre" in the 18th arrondissement. 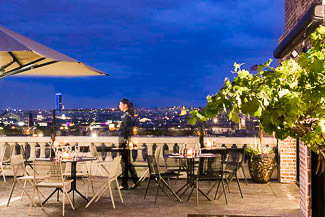 ABOVE: The panoramic roof terrace at Le Terrass", a four-star hotel near the restaurants, cafés, and shops of central Montmartre. The neighborhood of Amelie is especially charming after daytrippers have climbed onto their tour buses and left the former village's winding, hilly streets to residents and hotel guests. For Eurostar and other train passengers arriving at the Gare de Nord, Montmartre is within easy walking distance or a couple of Métro stops away. It's also handy to Charles de Gaulle Airport via RER Line B.
Montmartre is served by several different Métro lines. For example, you can board line 4 at Château Rouge and get off about 15 minutes later at Cité (Nôtre-Dame Cathedral) or St-Michel (Latin Quarter), or you can hop on line 2 at Anvers or Pigalle for a quick trip to the Arc de Triomphe and the Champs-Élysée. In our opinion, the question isn't whether to stay in Montmartre, but where to stay. For a true Montmartre experience, you don't want to be on a traffic-jammed boulevard or a neighborhood that merely borders on Montmartre. And unless you're in Paris with a peepshow tour, you'll probably want to avoid a hotel amid the fleshpots of Pigalle. To help you avoid disappointment, we've put together a collection of hotels represented by our hotel partner, Booking.com, which offers a "lowest available rates" guarantee. All of these hotels are located on pleasant and attractive streets within Montmartre--primarily on the southern side of the Butte, or hill, which offers easy access to the city center by Métro (or even on foot if you enjoy walking, as we do). These aren't the only places to stay in Montmartre, but--if you choose from our listings--you can be sure that your hotel won't be on a major avenue, next to a strip joint, or overrun by mass-market tour groups. Le Terrass" is a great place to splurge if you're on a honeymoon or romantic getaway weekend. The 92-room hotel is on the western side of the Butte de Montmartre, a two- or three-minute walk from the area's most popular cafés and restaurants. Public transportation is nearby, too: You can choose from Métro stops at Blanche (Line 2) or Abbesses (line 12). Amenities at Le Terrass" include a panoramic restaurant and bar with open-air terrace (where breakfast is served in nice weather), a small library, exercise rooms, free Wi-Fi, and--in some rooms--a view of the Eiffel Tower, which has an hourly light show after dark. The "Black Cat" is at the foot of Montmartre's Butte, which is both good and bad: Most sights within the neighborhood require a walk uphill, and the Boulevard de Clichy may seem tacky if you aren't used to big cities. The hotel itself is stylish, with a modern decor and 39 well-equipped single, double, twin, and triple rooms. Wi-Fi is free, and you can order breakfast downstairs or have it delivered to your room. As you can see in the photo above, Le Relais is in a location that oozes Montmartre village atmosphere. From the Rue Constance, it's only a short walk to restaurants, cafés, shops, and the Blanche Métro station. This hotel is on the Rue Lepic, close to the Moulin Rouge and the Blanche Métro station. Restaurants, cafés, and tempting food shops are close by, and it's only a short walk to the center of "village Montmartre." Le Squara is housed in a 19th Century building, with a decor that blends Art Nouveau and modern. Its 19 air-conditioned rooms include doubles, twins, and a triple suite, all with free Wi-Fi. We have mixed feelings about this hotel's location: It's on the eastern side of the Butte, away from our favorite Montmartre haunts, but it does have the advantage of being close to Sacré-Coeur and only about 20 minutes on foot from the Gare du Nord. It's also a very stylish hotel, with a unique decor that features giant images of famous 19th and 20th Century couples. Pets are welcome, and the 24 rooms have free Wi-Fi. This highly-rated hotel is smack in the middle of Montmartre's café and shopping district, near the intersection of Rue Lepic and Rue des Abbesses. The Abbesses Métro station is a few minutes away over mostly level ground. The Vigntneuf Lepic has 41 rooms (all with free Wi-Fi). In addition to singles, doubles, twins, and triples, the hotel offers family rooms and even a two-bedroom apartment. The "Hotel of the Arts" is on the Rue Tholoze, just downhill from an historic windmill in the center of Old Montmartre. It has 50 rooms (all with Wi-Fi), loads of traditional atmosphere, and convenient access to the Abbesses Métro stop. The Place du Tetre and Sacré-Coeur are a few minutes away on foot. The Hotel Basss by Happyculture is on the Rue des Abbesses, the main east-west street below the Butte of Montmartre. From the hotel entrance, you can walk to the village's best bakeries, any number of café-restaurants, small shops, and the Abbesses Métro station on a tiny square with an old-fashioned carousel. The Basss is pet-friendly, provides free Wi-Fi, and has rooms that range from singles to a family room with beds for four adults. As a bonus, the hotel offers free Nespresso coffee, pastries, and candies in the lounge from 2 to 7 p.m.
Paris has a number of Timhotels. The one you want is the Timhotel Montmartre, which is located on a pretty cobblestoned square with trees called the Place Emile Goudeau. The hotel has 59 rooms, all with free Wi-Fi, and has undergone updating in recent years. Tip: Unless you want the hotel's buffet breakfast, head for the café across the square for a petit dejeuner complet or buy a croissant at our favorite neighborhood bakery, Le Grenier à Pain on the Rue des Abbesses. The Pavillon is on a small side street just off the Rue des Abbesses in the delightful center of Montmartre. It's within walking distance of two Métro stations: Blanche and Abbesses. Rooms range from singles to quads, with free Wi-Fi (but without air conditioning, which could be a problem in summer). The Hotel André Gill is tucked into a side street off the Rue des Martyrs (Montmartre's celebrated foodie street), within a short walk of the Abbesses and Anvers Métro stations. It has 33 rooms--all with free Wi-Fi--and a small garden courtyard where a low-cost Continental breakfast is served in summer. This affordable hotel has a superb location, especially for its price category: It's just off the Rue des Abbesses in central Montmartre, only a short walk from the Abbesses Métro station. The Audran has 39 simple, cheerful rooms, all with free Wi-Fi (but without air conditioning, which is often the case in one- to three-star Parisian hotels). For proximity to shops, cafés, street life, and public transportation, Regyn's is hard to beat: The long-established hotel faces the Places des Abbesses and its Art Nouveau Métro station. Regyn's has 22 rooms, all with free Wi-Fi, and is decorated in traditional (some might say "old-fashioned") Parisian style. One-star hotels tend to be on the fringes of Montmartre (outside the area that we recommend), but the Luxelthe is an exception: It's on the Rue Houdon, roughly equidistant from the Abbesses and Pigalle Méstations toward the foot of the Butte Montmartre. The hotel's 40 simple, modern rooms have free Wi-Fi, and connecting rooms are available for families. The simple, reasonably-priced Bonséjour is at the corner of Rue Burq and Rue Durantin, a block uphill from the Rue des Abbesses in the center of Montmartre. Some of the 34 rooms have been undergoing renovation, so check recent user reviews before booking if you have an aversion to dust, paint smells, and noise. The Adagio has 76 studos and one-bedroom apartments that sleep two, three, or four adults. Its location couldn't be better: It's on the Place Charles Dullin, a tiny square between the Abesses and Anvers Métro stations in the center of Old Montmartre. Each studio or apartment has a small kitchen area, and breakfast is available on request. Wi-Fi is free, but the lack of air conditioning may be annoying in the summer months.